Location: Approximately 100m N of St Catherine's Church, set slightly back from the road behind a forecourt wall with railings. Presbyterian church of 1883, by Henry C Harris, architect of Cardiff. The design included a separate hall and Sunday school as part of a unified composition, a feature then becoming fashionable in chapel architecture. A chapel and attached hall combined as a single composition in an Early Gothic style influenced by William Burges. Of snecked rock-faced sandstone with pink stone banding; Bathstone dressings to the front and yellow-brick dressings to the sides, modern tiled roof to chapel, clay tiles to hall. To the R, the main body of chapel has angle buttresses with gablets. At the lower level are 4 lancets with foundation tablets below. The upper level has 3 taller lancets with sill band, from the inner spandrels of which 2 diagonal shafts rise to frame a cusped round window in the gable. To each side is a single-storey porch with Gothic doorway with double boarded doors, above which, set back behind parapets, are hipped-roof half-timbered pavilions with 4-light windows lighting the gallery stairs. Behind these, to the sides, are 2 hipped roofs over the 4-bay buttressed side elevations. These have paired Gothic windows lighting the gallery, below which are 2-light mullion and transom windows. Rear has gabled organ projection with upper rose window, and ground floor polygonal minister's room. The hall is on the L side of the chapel. It has a polygonal front end with a 2-light plate tracery window and single side windows lighting the gallery stairs. Beneath the main window is a blind tripartite mullioned window. Doorways to the L and R are in lean-tos, hipped to the L side, and have boarded doors in pointed doorways. On the L side is a pointed archway leading to the rear entrance. The side elevation has a higher gabled transept with 3 stepped lancets to the upper level and a 3-light window below, beyond which are 4 bays with paired windows. At the rear is a porch at right angles with a pointed doorway. Side lobbies each have polychrome tiled floors, wooden stair with turned newels, and half-glazed double doors. The broad interior has a steeply-raked 3-sided gallery with cast iron octagonal ground floor columns with foliage capitals in turn supporting columns with clustered shafts, supporting the roof. The gallery front is panelled. The 6-bay arched-brace roof has moulded principals on corbels, and has large boarded ceiling panels with broad ribs. The organ is in an arched recess behind the pulpit, the arch having two orders of chamfer of which the inner order is on moulded corbels. Behind the polygonal panelled pulpit is the organ seat, the back of which has similar blind Gothic panels. The organ is by W Hill & Son and is dated 1903. The vestibule of the hall has a staircase in the polygonal front bay, which has turned newels and balusters and moulded tread ends. A half-glazed gallery screen is at the top of the stairs, while double doors lead into the hall. In the hall is a single-sided gallery with panelled front similar to the main chapel on a single Tuscan column and with corbels in the side walls. The 5-bay arched-brace roof has diagonal boarding behind. 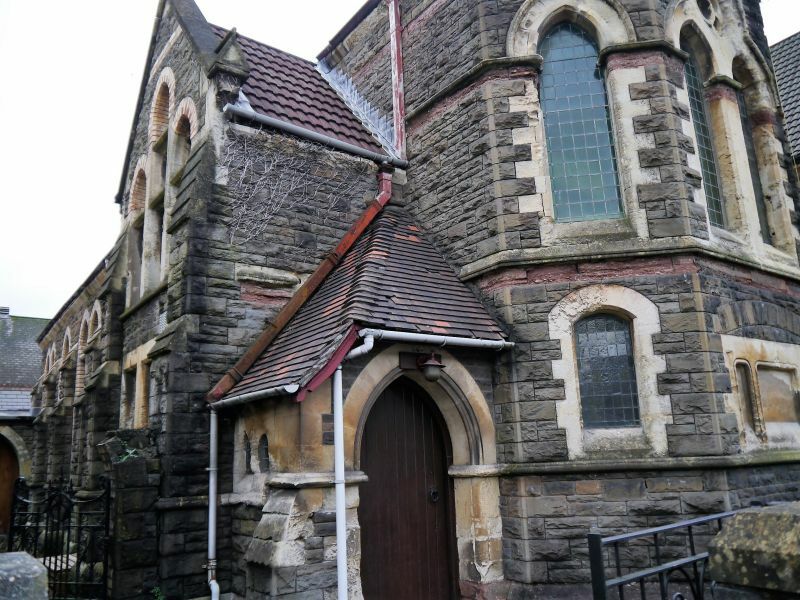 Listed for architectural interest as one of the finest later C19 Gothic town chapels in South Wales retaining its original character and detail. On the N side of the junction of Penuel Lane and Gelliwastad Road. In the centre of the junction of Taff Street and Penuel Lane. At the N end of Gelliwastad Road and on the S side of its junction with Chapel Street. Prominently sited in its own churchyard raised above the level of Gelliwastad Road. Towards the N end of Market Street within a row of shop fronts, and in the pedestrianised area of the town centre. On the SW side of the parish church. Within the pedestrianised area of the town centre on the N side of Market Chambers. In the town centre, uphill from and W of the attached Market Chambers.